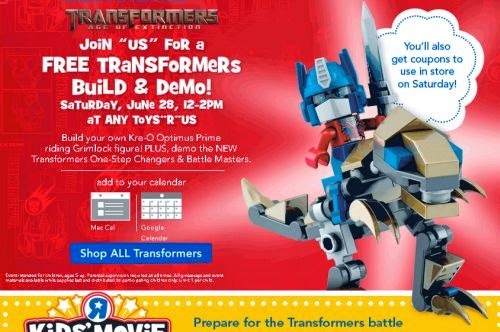 FREE Transformers Build & Demo Event at Toys “R” Us on June 28, 2014. Just click the link below to go check out the event calendar at Toys "R" Us. Build your own Kre-O Optimus Primeriding Grimlock figure! PLUS, demo the NEWTransformers One-Step Changers & Battle Masters.